This week I got to the Santa Fe Farmers’ Market in time to get fresh peas. You see, last week when I met Ramon Corona at his market table on a Tuesday morning, early shoppers had already scooped up the prize. But pea season is officially here now, and Corona has plenty more than the scant three boxes he had with him that first week in late May. He also still has lots of spring onions, green garlic, radishes and spinach for sale, but who can resist freshly picked sweet peas? 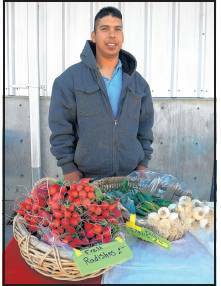 Corona is the 24-year-old son of Salvador Corona, a farmer who has been selling at area growers markets for about 15 years, ever since he arrived in northern New Mexico from Mexico. Though he has been farming with his dad for 13 years, this is the younger Corona’s first year selling on his own. He pays for his own seeds, his own gas to get to market, his own vendor fees and for his brothers’ help harvesting if he needs it. His dad “lends” him some of his rented farmland in Española to plant the crops. “I want to try and be on my own to see what my dad loves so much,” says Corona, whose wife, Nayeli, also helps in the fields and at market. Corona planted about 40 rows of peas, each 100 feet long, in February. In March they started coming up. Peas like the cold, so this spring has been good for them. “People love peas, but they are hard to pick. You have to feel every pod to see if they are ready. There are about 14 per plant, but maybe only five or six are ready at the same time. You have to feel each one to see if the little balls inside are ready. And you have to be on your knees to pick them,” he explains. Humans have cultivated peas for at least 12,000 years, making them one of the earliest crops, but it was centuries before gardeners developed peas that could be eaten fresh instead of only dried. At one time they were grown only in kitchen gardens — as opposed to field peas grown among crops in the field — but eventually they enchanted even royalty. During the late 17th century, peas were so expensive that only kings could enjoy them, and shelled peas became a food craze in the court of King Louis XIV, where the elite consumed them like candy. For many growers like Corona, peas are an important crop because they help bridge the gap between the winter and summer harvest seasons, providing them with much needed cash flow at a time when summer crops need maintenance but are not yet producing income. Pea season is about six weeks long, and in central and northern New Mexico, you can expect to find them from late May through early July. The season ends earlier in warmer climes and extends longer where it is cooler. Some growers also plant a fall crop because the peas like to germinate in the warm soil and then grow in the cooler months of fall up until the frost. Garden peas are often classified into two types: traditional English peas that must be shelled, and ediblepodded peas where both the peas and pods are eaten. Edible-podded peas are further classified into two groups. “Stir-fry” types are often called sugar peas or snow peas, while the other group is called snap peas. Snap peas can be eaten raw in salads or as a snack, served raw with dips or cooked like green beans. Like corn, peas are best eaten as soon as possible after harvest as the sugars start converting to starch the moment they are picked. For the best flavor, choose small peas, which are younger, sweeter and more tender than large ones. The peas inside should be small, bright green, and firm; if you taste one, it should be tender and sweet. When buying fresh peas, remember that one pound of peas in their pods yields about 6 ounces (1 cup) shelled peas. Use peas quickly or freeze them. Store pods in a plastic bag in the crisper drawer of the refrigerator and use them within a couple of days. Once peas are shelled, the best way to store them is to freeze them. First blanch them for a minute or two in boiling salted water and then shock them in an icewater bath until cool to help maintain their bright color. Drain and freeze them in ziptop bags. They will keep for five to six months. Corona sells both English peas and snap peas, and says his favorite way to eat them is in the field as he picks them, especially if he is hungry. Fresh peas need only minimal cooking. To maintain their sweetness and bright green color, cook them only until just tender. If you are boiling them, two to three minutes is plenty. If you are using them as part of a cooked dish, add a few at the start of cooking, to add flavor, but save most to stir in a few minutes before serving. Peas’ mild sweetness pairs well with many different flavors. Try them with mint or other fresh spring herbs like basil, chervil, chives, tarragon or dill. Peas also play well off cured meats like bacon, pancetta and chorizo, and they complement any starch — potatoes, rice or pasta. Throughout the season you will find Corona selling a bit of everything — cucumbers, chile, onions, melons, tomatoes, tomatillos, fava beans and more. But right now — before the July heat takes hold — make sure you get plenty of fresh peas to bring home and savor.